The Hague today begins hearings into the legality of Kosovo’s unilateral declaration of independence, which Serbia maintains is a violation of international law. The Kosovo Albanians’ snap decision to break away from Serbia on February 17, 2008 triggered an avalanche of condemnation from Belgrade, which successfully petitioned the UN General Assembly for a legal review of Kosovo’s announcement. Serbia maintains that the ethnic Albanian territory is an inseparable part of its history and culture. Since 1999, when NATO forces bombarded Serbia for 78 relentless days in an effort to end hostilities between the forces of then-President Slobodan Milosevic and the separatist Kosovo Albanians, the international community has been looking for some closure on the issue. But there is a high probability that the ruling from the ICJ, whatever it may be, will create more questions than answers. Hisashi Owada, President of the ICJ, said the advisory ruling will provide no definite answers. “The advisory ruling will be on 30 pages, and there will be no clear-cut answer there, yes or no, for or against – it will simply have to be read,” Owada commented during a video-link between Moscow and The Hague that was organized by RIA Novosti in November. After the court presents its findings, which is expected to take several months, it will be subject to legal interpretation from Pristina, the capital of Kosovo, and Belgrade. In other words, both sides will interpret the ruling in a way that favorably supports their stance, which will only serve to exasperate the issue. “The judges may have different opinions, which sometimes do not tally,” Owada admitted. Established in 1945, The International Court of Justice (or ICJ) is the main judiciary branch of the United Nations. It is based in the Peace Palace in The Hague, Netherlands. Its primary duties are to settle legal disputes submitted to it by states and to give advisory opinions on legal questions submitted by international organizations, agencies and the UN General Assembly. The ICJ should not be confused with the International Criminal Court, which also potentially has international jurisdiction. The ICJ is composed of fifteen judges elected to nine year terms by the UN General Assembly and the UN Security Council from a list of persons nominated by the national groups in the Permanent Court of arbitration. Presently, there are 12 cases pending in the World Court's docket. The current president of the ICJ is Hisashi Owada, a former Japanese diplomat. The ICJ, headquartered at The Hague, Netherlands, is the only international court with universal jurisdiction, but its decisions are not legally binding. It has been reported that 36 states have passed their opinions to the international court on the issue of Kosovo’s statement of independence, including Russia and China, which side with Belgrade, and the United States, Britain and France, taking the side of the Albanian authorities. Brkic mentioned the rare interest of China, the communist nation that has traditionally stayed on the sidelines whenever international intrigue is concerned. Serbia’s main reason for bringing their case to the ICJ is to keep the question open, according to Brkic. Only 63 nations – 22 representative of the European Union – recognize Kosovo's statehood. But the situation in and around Kosovo, where about 14,000 NATO troops are stationed to keep the peace, remains tense. Analysts say Belgrade will probably argue before the ICJ that Kosovo’s fledgling institutions are not viable enough to support the mantle of sovereignty. Indeed, UN-sponsored elections held last month in Kosovo were marred by violence and allegations of ballot-rigging by the opposition. Meanwhile, voter turnout was estimated at 45 percent amidst weak turnout from the minority native-Serbians living in Kosovo. 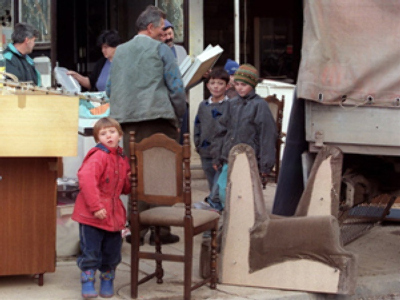 Native Serbians in Kosovo make up an estimated 7 percent of the population of 2 million. What is more important, the self determination of nations, or respect for the sovereignty of racial groups of minority nationalities? Brkic then offered his personal prediction on the much-anticipated court ruling. The ICJ has issued 25 advisory rulings since it started work in April 1946, but such opinions are not legally binding.